Julie Ferwerda's website | Can God Bring Good Out of the Garbage? Can God Bring Good Out of the Garbage? In some ways, living in this fallen, broken world is like living in a garbage dump. Some days I feel like a scavenger looking for small treasures in the middle of a giant trash heap. And just when I'm learning to survive (and thrive) in this trash, a pay loader zooms up out of nowhere and dumps another load stinky stuff over my head. That's just how life feels some days. We all have lousy things happen. Not one of us is immune. Even if you've been endowed better than the rest of us with smarts, riches, good looks, education, noble descent, or whatever, you have problems and get the garbage just like everyone else. Now before you feel the urge to go pop a bottle of Prozac, keep reading, because the point is that God is good, and He has made us a promise—one that we can hold onto when the going in life stinks like rotten garbage. Of course, we see a condition in this promise. It is for those who love God—who are willing to obey and seek His will and purpose for their lives. But the promise is there. All things may not be good, but the good God promises that He can and will bring good out of any and everything that happens to us, if we are only patient through the process, as Job, waiting to see how it all comes together. 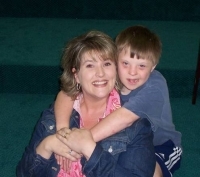 My friend Melodie had garbage dumped on her head 14 years ago when her first child, Jonathan, was born with Down Syndrome. Like the rest of us, Melodie wondered how anything good could ever come out of this terrible turn of events. Even in the early years after Jonathan was born, all she could see was that her baby wasn't like other kids. He didn't have the opportunities or abilities, and everything was so hard. To say it was a huge loss of dreams was the understatement. But God began to show her things through these fourteen years that have changed her mind and perspective. First of all, Jonathan brings so much joy to her life on a daily basis. He is funny, lively, and mischievous, and brings a ray of sunshine to the whole family of five. One of her worst nightmares in life turned into one of her greatest blessings. Today, she sees Jonathan as a very special gift—a treasure in the trash heap of life that she feels honored to have been entrusted with. What's your story of trash to treasure? What is one thing that you can see in your life that started out horrible, but God turned into good as you patiently (or not) waited for His promise to come true? Share it with us today because we could all use a dose of Heavenly Prozac. This is actually the second occasion I tried to leave a remark.